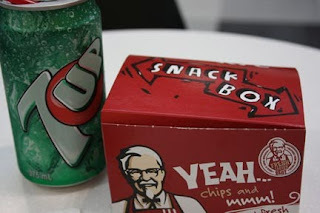 Lately I have been trying to stay away from to much fast food but the other day when I went to see Hubble 3D I had a craving for Kentucky Fried Chicken. No matter what I did, once it was on my mind there was no getting rid of it. So I thought if I have to have it I best go as small as I can. That brings me to my "S" word for today. My fast food treat was a KFC "Snack Pack", and a can of "Seven Up". Hey I just realized I have found two "S" words with you tonight. I must admit it, it was yummy. I think that if you are trying to eat healthy and you have an almight craving, its best to treat yourself occasionally, otherwise for me I end up going crazy. So I had my treat and that satisfied me for a while. I like the name of the blog. I think we all fall for the flavors and salt and sugars put into fast food and most other foods. We are addicted. What a wise concept, Davine. Makes a lot of sense to have a LITTLE indulgence to satisfy the craving ... Great "S" words, today! Just checking to see if you feel better. Reading of your battle with "junk" food makes me long for some myself. Sometimes a girl's just gotta have some KFC. I need a "fix" every month or so. Bon Appetite. Как говорилось на Seexi.net Кто-нибудь использует? Я вот виджу всё чаще в магазине... Думаю, может нужно купить... Только несомненного мнения, что нужно и никаких гвоздей нигде не слашала.